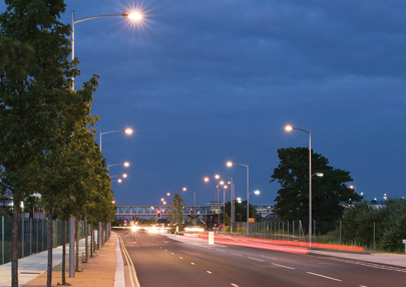 Monaro luminaires from DW Windsor have been used to upgrade the lighting in Victoria Way, one of the major road links to the centre of Ashford, Kent. The project has delivered considerably improved lighting and enhanced colour rendering without increasing the installed electrical load. Prior to the re-lighting of Victoria Way, Ashford had seen significant recent investment in the regeneration of its town centre. Victoria Way provides an essential route to the town centre and will support its future expansion. Ashford Borough Council therefore decided to create a wide, tree-lined avenue, for pedestrians and motorists. To that end, the Council consulted with DW Windsor, which has a strong reputation in the local authority sector for delivering imaginative, cost-effective lighting solutions. The solution was to simulate the branched appearance desired by the Council, using Monaro luminaires, combined with Evora C8 brackets on tapered columns, with around half the columns bearing both path and road lanterns. This reduced the total number of columns required for the project, thereby saving money as well as reducing the impact of the lighting on the appearance of the leafy avenue. Two versions of Monaro luminaires are being used on the project: to light the roads, 90W Cosmopolis lamps replace the original 150W SON lanterns in conjunction with Diamond Optic® reflector system, delivering greatly improved lighting levels and colour rendering, with precise light distribution. The footpaths are lit with complimentary post-top and side entry Monaro luminaires fitted with 24 x 2.4W LEDs. The Monaro LED luminaires, mounted at low level, use DW Windsors Diamond Array optics to optimise the light distribution for pedestrians while ensuring no glare for motorists. Concerns over vandalism were addressed by the lanterns robust construction and vandal resistant fixings. The luminaires are also fitted with dimming ballasts to enable 50% dimming between midnight and 6 am, thereby further reducing energy consumption when traffic volumes are low.